The next morning we took the local train to Pompeii. From one of the most expensive forms of transport (Capri ferry 40 Euro) to one of the cheapest – Sorrento-Pompeii return about £4 – we rattled our way to the wonder that is Pompeii. Hiring the guide was a good choice but I did find him arrogant and plain rude, perhaps that’s my English nature. Pompeii was astounding in scale, detail and preservation. You can quickly forget that this was a Roman town almost 2 thousand years old and think you’re in a Umbrian hill town where you expect a vespa to buzz round a corner at any moment. The guide provided a wealth of interesting information but I prefered just wandering around discovering amphitheaters, forums and cemeteries. Luckily the weather was not too hot (I can imagine it becomes a furnace in the summer) and we could ramble about for around for a few hours quite pleasantly. The good weather also gave us a glimpse of how close Vesuvius was and we were able to see the crater rim, giving us an idea of how much of the original volcano was projected into the air. 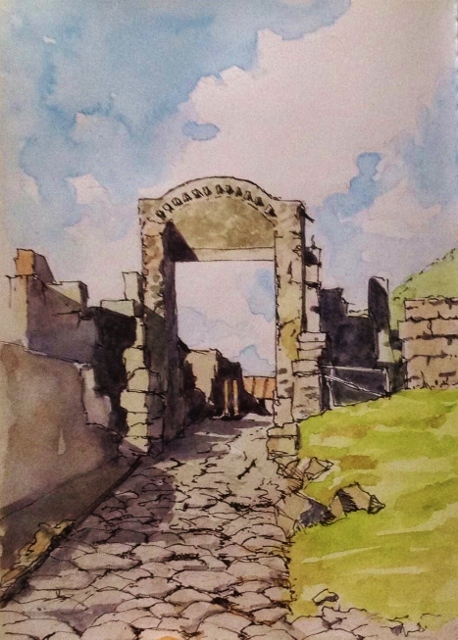 I had taken my sketchbook but the scale of Pompeii meant I had no no time to use it. But I did draw this scene later. Tired, but refreshed by a gelato and cold orange juice while waiting for the train we returned to the hotel. An hour or so later we were in another Tango class, with Sandra and Santiago, who introduced Colcadas to us. Thanks to Machiko who was a model partner, she got me spinning her like a top! 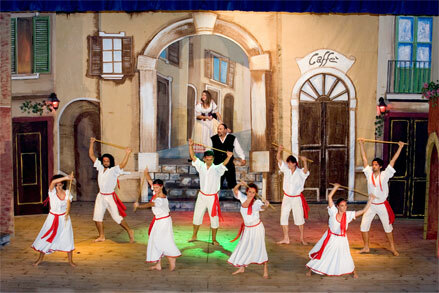 In the evening we all went to the local theater and enjoyed a very local song and dance show of all the southern Italian favorites (i.e. O sole mio). Well sung, danced and performed the evening was a delight but I was caught napping a couple of times – well Pompeii and Colcadas are a tiring mix. The next day (our last full day) I spend the most of it getting to know Sorrento and drawing in the port, finishing off the drawing from Sunday. 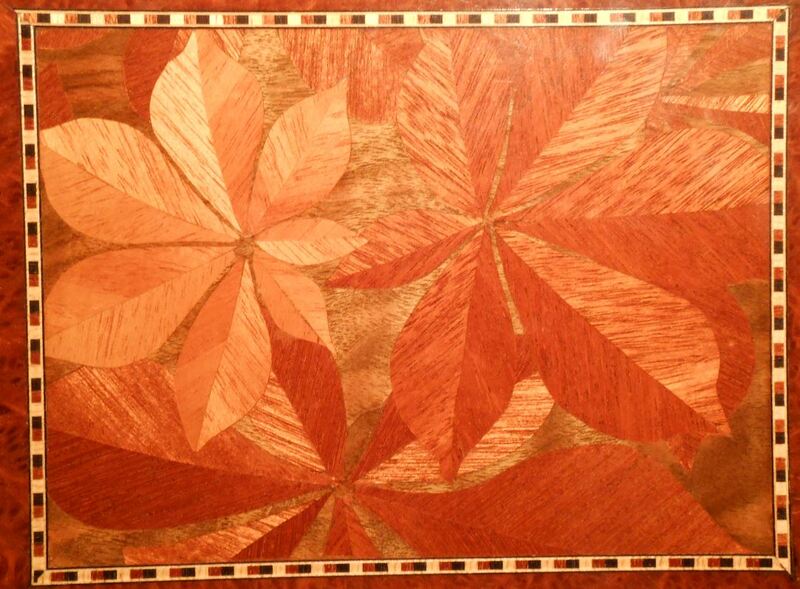 I hadn’t realised how important marquetry and inlay work was to Sorrento. I mention this because I used to do this as hobby about ten years ago. 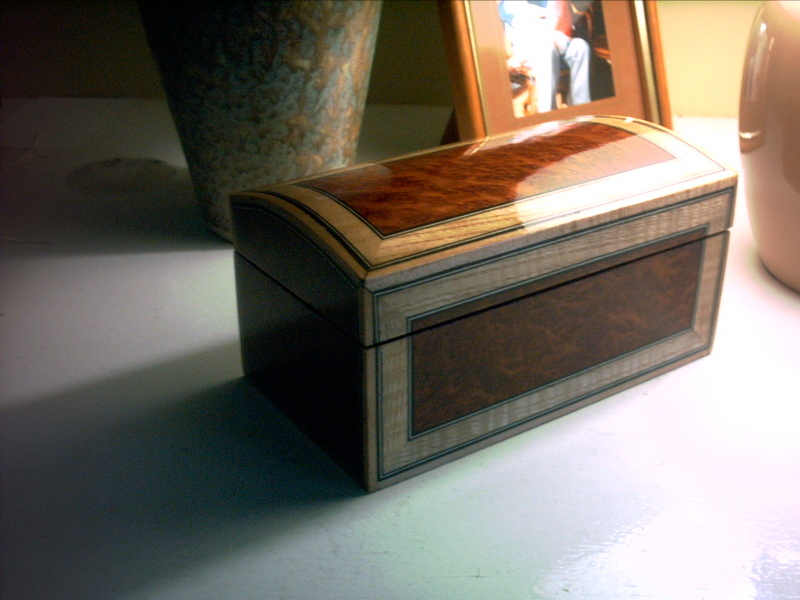 It was fascinating to see the quality of the work achieved by the professionals (and also the prices) but I think my boxes were not too far off. Here are a couple of examples I created. The final lesson was a review with the inclusion of a female sacada, which I will be using when brave enough. We created our own Milonga on the final night, by the bar and joined by our friendly Austrian/Germans. Thanks to Sandra and Santiago for organizing the wonderful holiday, it all went very smoothly. And I made some lovely new friends and had many beautiful dances- thanks ladies.